Walram of Julich. AD 1332 to 1349. Date: not dated but struck ca. 1333 or 1334. Size: 26.9 x 27.7 mm. Weight: 3.76 grams. Grade: gVF over all, but weak on the mouth. Obverse: Bust of a Bishop, with WALRAM ARCHIEPES COLONIE around. Reverse: Short cross with two rings of inscription. The inner ring reads MONETA TVYCIEN around. The outer ring reads XPC VICIT XPC REGNAT XPC INPAT around (Latin abbreviations for CHRIST REIGNS, CHRIST CONQUERS, CHRIST COMMANDS). Hungary. Bela III , AD 1172 to 1196. There is some debate over who issued these coins. 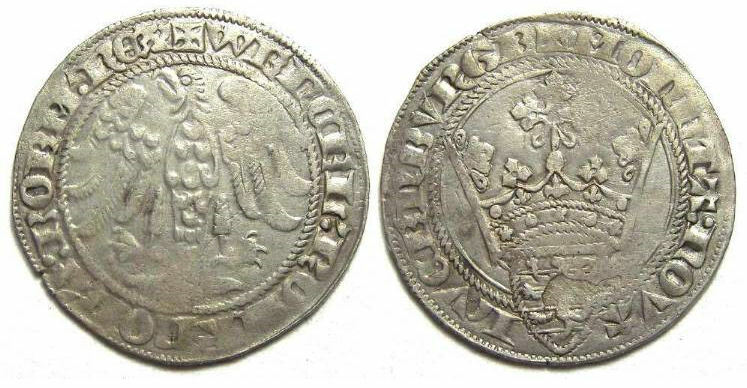 Some references attribute them to Stephen IV between AD 1162 and 1163, in which case the Bela seated by sides him has to be Bela II,who died in 1141. 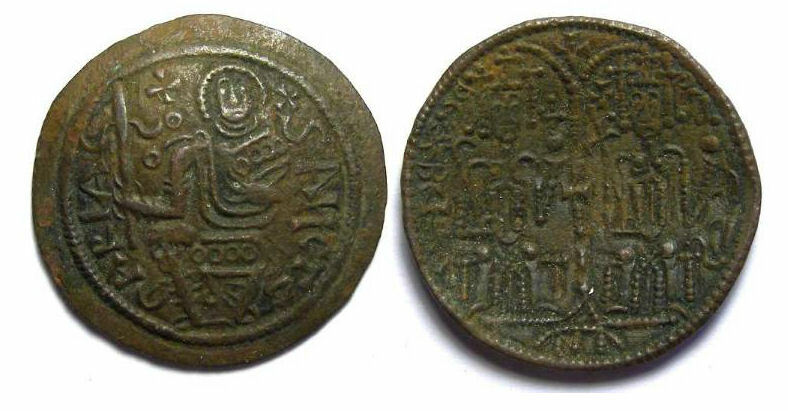 Other references attribute these to Bela III between AD 1172 to 1196, in which case the Stephen beside him has to be Stephen IV who died in 1162. Huszar attributes them to Bela III, so we are using that attribution. Size: 25.9 x 26.6 mm scyphate (dish like). Weight: 2.78 grams. 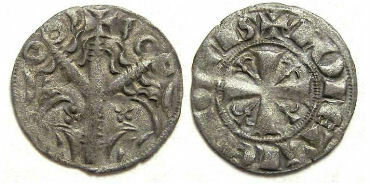 Obverse: Madona seated forward, hold a sword like sceptre, with SANCTA MARIA around. Reverse: Two kings enthroned, with REX BELA REX STS around. 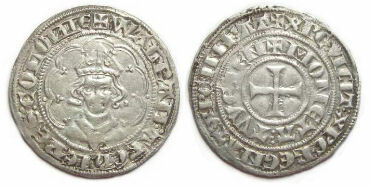 Fernando III, AD 1230 to 1252. Billon dinero. Fernando III became King of Castille in 1217 and King of Leon in 1230. This coin was struck as King of Leon (and thus King of Castille and Leon) and so this coin was struck between AD 1230 to 1252. Size: 16.9 x 17.4 mm. Weight: 0.79 grams. Reverse: Short cross with fleurs in quadrants, with MONETA LEGIONIS around. 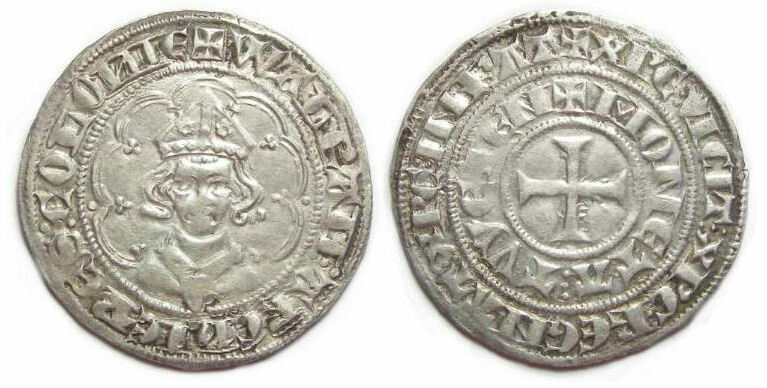 Wenceslas II, AD 1383 to 1388. Denomination: Silver Gros An Gene. Reference: Weiller 154. Probst 184. Size: 27.5 x 28.0 mm. Weight: 2.75 grams. Grade: VF but weak areas on the obverse, and a small lamination has come away on the shield below the crown. Obverse: Eagle with wings spread, with WENCEL ROMANOR Z BOEM REX around. Reverse: Crowned shield, with MONETA NOVA LVCEBVRGE around.